Learn how to convert innovation and creativity into business success through effective design management. Taught by experts with extensive research experience and industry knowledge, this degree opens up career possibilities in a wide range of sectors. The MA Design Management explores the effective use of design in a business context, encompassing product design, process design, service design and brand design. You’ll gain an understanding of the whole design management cycle, from the identification of market trends and use of research to inform the design process, through to branding, marketing, after-sales and product recycling. 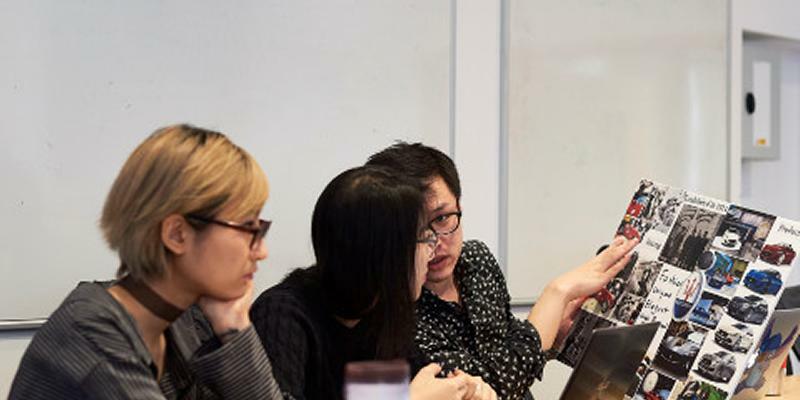 The programme is taught by academics with industry experience and research expertise, including specialist knowledge of the relationship between design and finance, and design and law. They use interactive activities such as practical mini projects, study visits to London museums and a simulation workshop to consolidate your learning. In addition, guest lectures by external practitioners offer industry insights and a chance to build your networks. Taught within a creative art school environment, the course offers the academic rigour that you would expect from a Russell Group university, and you’ll graduate with knowledge and skills that will enable you to advance in a wide range of sectors. This course will be of interest to those from a design background who want to advance their career through a greater understanding of the design management process, or to those with a business background who are interested in focusing on design management. Our students include recent graduates and those with professional experience. This is a full-time, one-year course that includes lectures, tutorials and workshops in semesters one and two, followed by a period of independent study for your dissertation. In the first semester you’ll be introduced to the fundamental concepts and theories that relate to design management, including the historical context in which it has developed and contemporary research debates. You’ll learn about the position of design within companies, its relationship with marketing, finance and other departments, how design is used to deliver business goals, and the importance of measuring design effectiveness. The course covers areas such as customer experience design, brand strategy, design strategy and design law, as well as project management and risk management. You’ll also gain a valuable understanding of how to assess the commercial return on design investments within a company. In semester two you’ll explore design management topics in more depth, such as sustainable product and service design, corporate social responsibility and packaging design. You’ll put your learning into practice by undertaking a number of mini projects, which might involve auditing the user experience of a banking service and making recommendations for improvements, or looking at brand design for luxury or not-for-profit sector organisations. A Contextual Studies module, in which you’ll explore contemporary design management issues and debates. This module also includes a popular marketing simulation workshop in which you’ll apply your knowledge within a simulated competitive market environment. Working in a group, you’ll set up a company, devise and sell a product, then use customer and market feedback to review and develop your offering. Professional and Academic Skills modules, which will give you a thorough grounding in research methodologies and help you to develop essential workplace skills, such as communication, presentation and time management skills. An optional module that you can choose according to your own interests. The range of options reflects the expertise of academics across Winchester School of Art and includes creative and business-related subjects, such as entrepreneurship, responsible design, marketing, visual presentation or cultural politics. You could decide on an option that complements your design management studies or take the opportunity to explore a completely new area. We arrange a study visit in each semester, enabling you to consider design management issues in different contexts. These have included trips to London to visit the Design Museum and the Victoria and Albert Museum. The dissertation, which you’ll undertake during the final months of the course, is a chance to explore in depth a topic that interests you. You’ll be supported by an experienced academic supervisor who will help you to formulate a robust proposal and advise on research methodologies. customer-focused design activities for NPD for SMEs in the UK. the virtual world of luxury goods - an analysis of improving a luxury fashion brand in a digital context. improvements for brand loyalty based on customers’ experience of a major toy retailer. the relationship between companies’ effectiveness in design management and their profitability. how Nike’s brand extension impacts on its brand image. You’ll be taught by academics with specialist expertise in design management, including the financial and legal aspects of the subject. Their active involvement in research and regular attendance at conferences means they can bring you the latest findings and current debates in the field. It also means they can share their knowledge of research methodologies. For example, programme leader Dr Yuanyuan Yin uses case studies from her ESRC Funded ‘Silver Shopper’ research project to help students understand issues around questionnaire design and the design of supermarkets. Programme leader Dr Yuanyuan Yin, a design management expert whose research explores user-centred design and design for an ageing population. She leads a project funded by the Economic and Social Research Council that is working with industry to look at the role of design in improving the supermarket shopping experience of older customers in the UK and China. Before she joined the University, she worked as designer and design researcher for several design companies such as Lenovo in China, Design Bridge and Xerox in the UK. Aqeel Ahmed, who specialises in design management, global marketing and branding. He is a Fellow of Higher Education Academy (FHEA) and a member of the Chartered Institute of Marketing (MCIM). His research interests include corporate identity positioning, corporate image and perception, performance measurement for brands and brand-based intangible assets. Ian Solway, whose research and industry expertise encompasses intellectual property law, lean systems design and innovation. Before becoming an academic he was employed as a consultant by the UK government to develop the capabilities of high growth start-up companies. Vanissa Wanick, whose interests include gamification, interaction design, digital design, user experience design and cross-cultural consumer behaviour. She has international experience in digital design and user experience design, working as a designer for several companies in Rio de Janeiro, Brazil. We have strong links with a range of industry sectors. External practitioners are regularly invited to give lectures and run workshops, where you can see how design management theory applies to real-life business scenarios and have a chance to network. an architecture design consultancy, who talked about inclusive design and the management of architecture design projects. In addition, our academics bring their professional experience to the course and share insights gained through their research links with companies such as Xerox, Design Bridge (a global brand design agency) and major supermarket chains. Gain an in-depth understanding of design management that you can apply in any business sector. Covers product design, process design, services design, sustainable design and brand design. Benefit from a creative art school environment while studying for an academically robust, Russell Group university degree. Learn from academics with extensive professional experience and research expertise, including specialists in the legal and financial aspects of design management. Uses hands-on, interactive learning approaches, including mini projects and a sophisticated marketing simulation workshop. Visits to major London museums and guest lectures by external practitioners will further enrich your learning. Benefit from superb facilities including comprehensive library resources, Mac suites with industry-standard design software and access to the art school’s studio equipment. Graduates destinations include Evian and Apple; alumni have also established their own design management consultancies. The admissions policy for MA Design Management is based on students having a good honours degree in a relevant subject (2.2 or above) or an equivalent standard in other qualifications approved by the University. You are able to progress to this MA programme via the University's Pre-Masters programme. Our graduates have gone on to work for in-house design teams at major companies such as Evian, Tank Innovation, iFLY TEK and Apple, and for market research companies and television companies. Some have become university lecturers and others are undertaking PhDs. Former students have also set up their own design management consultancies. You’ll learn through a mix of lectures, seminars, and independent study, with plenty of opportunities to put theory into practice through hands-on projects. Guest speakers and study visits to London museums will further enrich your learning. Assessment methods vary by module, but may include presentations and written assignments, such as project reports and critical analyses. Your dissertation will also contribute to your final mark. To help you keep your learning on track, after each marking period you’ll receive a feedback sheet. Your tutor will go through this with you to help you identify your strengths and areas for improvement. Outside of the curriculum, you’ll be encouraged to attend relevant conferences, such as the Design Management Institute conference. We regularly invite students to give us their views on the programme to ensure we continue to provide the best possible learning experience. We listen to their comments and suggestions at group and individual feedback meetings, using the information to enhance the programme and the way we communicate with students. You’ll benefit from superb library facilities as well as PC and Mac computer suites with industry-standard design software such as Illustrator, Photoshop and InDesign. You’ll also have access to the School’s studio equipment, such as textile printing machines, which you may choose to use for your project work. Training and support is provided by the School’s skilled technicians. 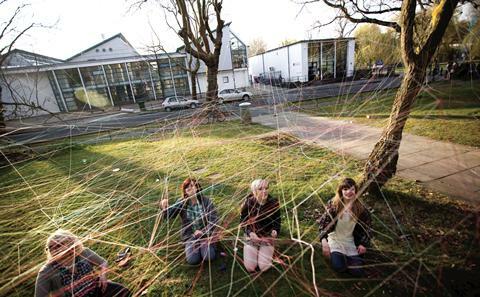 When you arrive at Winchester School of Art you’ll join a close-knit learning community. Our friendly and approachable academic team is dedicated to supporting students to help them achieve their potential. You’ll be allocated a personal academic tutor who will be the first point of contact for any queries or issues you may have, whether academic or otherwise. In addition, the University offers a wide range of learning, welfare and support services should you need them. Students on this pathway come from a diverse background. Set within the context of a vibrant art school, the Design Management is an exciting option for students wishing to enter the creative industries in the domain of management and marketing of design. Design at its essence connects creativity and innovation. Excellence in design gives companies the means to gain competitive advantage by creating attractive propositions for customers. This pathway is suitable for the individuals eager to develop a career in Design Management that is relevant to a wide sector of services and manufacturing industries. You will be encouraged to develop original and creative ideas that will allow you to negotiate and co-create with designers, marketers, financers, lawyers, and clients in the pursuit of the best design thinking. Product and services design is used by the companies as a competitive advantage and this requires artistic skills along with commercial and entrepreneurial abilities. The Design Management pathway supports students to develop capabilities in analysing and synthesising key issues of market and consumer research with brand identity design, design strategy development and service design, with an aim to improve the business performance. The MA Design: Design Management programme is aimed at revealing the management and entrepreneurial aspects of design. Student learning covers the aspects of product design, process design, services design and brand design. The syllabus consists of lectures, tutorials, industry tours and seminars delivered by different academics and practitioners. The theoretical base for this programme also equips students with the skills to manage design projects and interpreting the financial impacts of design initiatives. To nurture your critical and creative thinking, balancing an appreciation of management theories with informed recognition of the design process. To develop your abilities to conduct quality research that is relevant to the demands of design function. To develop a consumer-focused appreciation and implementation of design. To develop strong study and employment skills with self-awareness and confidence. Help you choose between a career in a design business or your own enterprise.